Vermont Sheep producing Vermont Wool, spun into the softest yarn at a Vermont Fiber Mill (Thank you Hampton Fiber Mill), and shipped to you from a Vermont zip code, of course! Skeins are about 2 oz, 140 yards, DK weight. $14/skein, $13 for 3 or more. 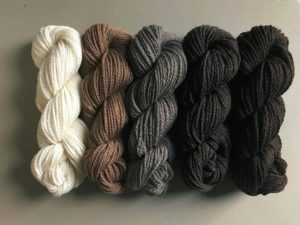 Colors: Bright white, light brown, warm gray, dark grey, almost black. 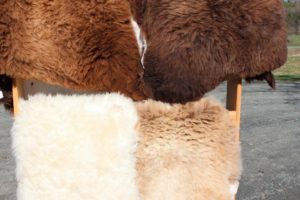 Corriedale sheep are known as a dual-purpose breed, producing both fine wool and meat. The original breed was developed in Australia and New Zealand by crossing Merinos (known for their very soft wool) and Lincolns. Our starter flock consisted of two black ewes, a white Merino-Polypay cross ewe, three brown lambs, a white Cormo-Corriedale cross lamb, and a brown ram (currently keeping the ram company are three wethers). We hope the colored and white fleeces will be attractive to hand spinners and dyers. In November we added nine Cormo sheep – seven ewes and two wethers. Most of the Cormos have medium to dark brown fleeces. Cormo wool is also very attractive to knitters and spinners. We can’t wait to get it all back from the mill next year. We sheared the flock in March, 2017. We used Hampton Fiber Mill and Spinnery for most of the fleeces. Michael Hampton does a wonderful job! Micron testing on the fleeces have an average fiber diameter of about 27 microns.